If you are anything like me, you will want to add to your flock from time to time. Maybe you want to add a new breed you’ve been reading all about. Maybe your flock isn’t laying the way they use to. At some point in your chicken raising experience, you’ll want to bring home some new birds. When adding chickens to your established flock you will frequently hear people stressing the importance of quarantine with the new birds. If you are anything like me, it’s easy to think of reasons why this isn’t important. The ever famous it wont happen to me. Guess what? Given enough chances (or even just the once) it will happen to you. Before we get into the nitty-gritty of quarantine, please acquire your birds from a reputable source. I’m not knocking sources like CraigsList, but if you are buying birds from an unknown source, be sure to give the bird(s) a full work-over before bringing them home. If the seller has a flock elsewhere on the property, ask to see those birds as well. Seeing their flock will give you an idea on how the birds are treated and the conditions under which they are raised. Space that you just don’t have. Time to wait before adding to the flock. A trusted person you’re getting the bird(s) from. Dividing the run/put the new bird in a dog crate in the coop; isn’t that good enough? I fell victim to trusting the person I purchased my new bird from. I’ll share my story and then give you all the 411 you need so it doesn’t happen to you. I had seven chickens with room for eight and with chicken math being as it is, if there is a space, it must be filled. I contacted someone from my state who is highly respected in the Chicken World. He had a bird that met my breed desires, so I drove the three hours to bring home my new barred rock. That night my middle son named her “Kyleigh Angel.” Kyleigh spent the night in the garage, but seeing as she came from an NPIP certified flock and a responsible poultry keeper, I figured I could sneak her in the coop the next night. The next day I let her out in the run. I call it a run, but it’s the back half of my property, so it’s really a modified free-range situation. Other than a few squabbles of pecking order over the next week, everything went beautifully. One morning I went out to throw scraps in the compost bin and I noticed one of the hens standing in place while the other hens came running. After tossing in the scraps, and leaving the girls to their feast, I went over to check her out. The first sign that there was a problem was that I bent down and picked her up with no problems. This particular hen tends to be a bit flighty. When I had her in hand, I realized her entire sinus cavity was swollen and she had bubbly white discharge coming from her eyes. I went inside and jumped onto BackYardChickens.com to see if I could find some answers. There was a lot of helpful information, but before I could make it out the door to get medication several more chickens began showing symptoms. I was sure they would all be dead and strewn around the yard before I got back from the farm supply store. Thankfully they weren’t, but within a day, they were all sick… except for Kyleigh. Long story short, we finally got to the end of things. We lost two birds and the children were heartbroken about the losses. I realized in that experience how important quarantine is. Now I am sure to do it every time. So, you may ask, how do I quarantine properly? Keep the new birds at least 36′ away from your flock or (if space allows, keep the new birds inside a garage or shed). Many chicken diseases/illnesses are airborne. If you simply divide them with some fencing material, ill chickens can still contaminate the healthy chickens. It drives me insane how many people give out the advice of dividing the run until everyone has gotten to know everyone, then let them go. Disease spreads and hearts break due to advice like this. You want to have two completely independent setups. By telling yourself the new birds are sick, you’ll act in a more cautious way. This is a haz-mat situation. Do not wear the same clothes/shoes when dealing with the new birds that you did with the flock and vice-versa. It may sound silly, but you might even want to consider purchasing medical booties. For under $10 it gives a little peace of mind. Keep everything separate. Germs can live on these surfaces. A reader suggested getting into the habit of working with the old birds first, that way you don’t need to worry about contaminating the old flock. The longer you can keep everyone separate, the better. Many people throw around the numbers ten days to two weeks, but months is better. Not only will keeping them apart for a longer period of time increase the odds of you seeing something suspicious, but it will also aid in integration later on. The new birds will be more comfortable and will not feel like the new birds since they have been part of your homestead for a while. Although it sounds heartless, you may want to send in a test subject. If you have a large flock (say 20+) you can risk one of your old birds by keeping it near the new bird for a week or two to see if it gets sick. This can sometime prevent a suppressed disease that could infect the entire flock. Often (especially with the dreaded MG) the sick bird will not display that they are a carrier. It isn’t until the old birds are exposed that you know you have a problem. That was exactly what happened with our flock. Kyleigh was a carrier, but appeared completely healthy. She passed on an infection that made the non-carrier birds sick. Watch the new birds for signs of illness. These signs may include coughing, sneezing,eye discharge or swelling, unusual gait, discoloration of the wattles/comb, drowsiness and unusual poop. Also keep an eye on your older birds. If one of them is showing symptoms it may indicate that you haven’t quarantined properly. If caught early there may be time to treat. This could not have come at a better time. Just yesterday I was offered 2 1-yr-old Cochins from a friend. We knew that quarantining was necessary and before I could google the best way to do this, VOILA!! Your email came. Thanks for the solution! I would also love to know what type of hens those are pictured above. The Lakenvelders I find on google search are very white and have very black head and hackle (neck) feathers and a black tail – these must be someone’s hybrid mix w/a Plymouth Rock type breed? I too would love to know what they are – they ARE gorgeous! 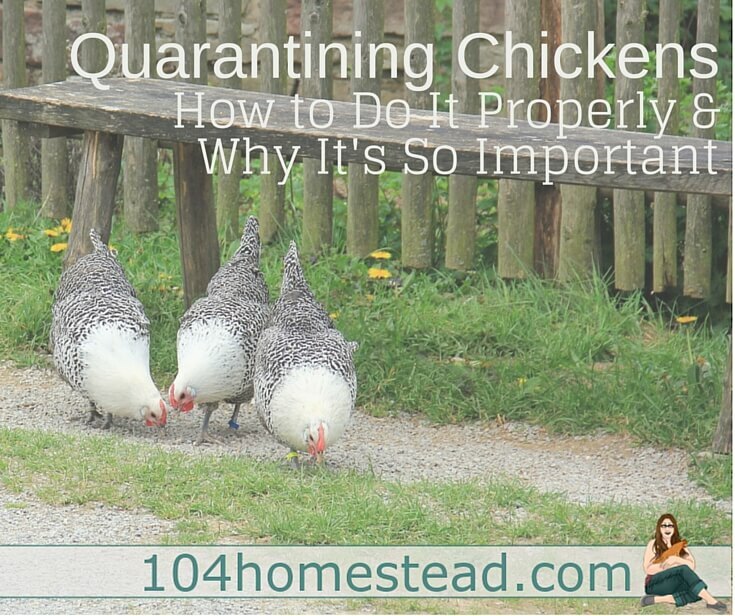 I too, have an important lesson regarding quarantine – and it includes a lesson on not looking a gift-horse in the mouth too, Our propane guy said he was “overrun with 75 chickens too many” and because of that, many of his flock were being pecked bald. He said he’d love to give me a dozen 1+ year-old hens, and he came the next day. His chickens were truly half bald. In fact one little Rhode Island Red hen and a gold hen looked like they were ready for a baking pan – they were that pathetic. Of course my quarantine space wasn’t adequate- just a fenced-off space IN the coop…. but it didn’t matter, the new birds escaped it as we were releasing them in. Well, there were few squabbles and it seemed things were fine. And it is a long story, including some of the hens turning into roosters, ha ha on me, but in the end, things were fine until my old rooster died – over a year later. I wanted to say good bye to him and held him on a mat, on my lap for about 20 minutes. Then I felt itching on my scalp… several times. It occurred to me that it wasn’t normal nerve endings going off, and it wasn’t my imagination. I put him down and felt heebie-jeebie itching on my arms too! I ran in and got a magnifying glass to look at the little piece of sand on my arm – I quickly discovered that it was a poultry louse!! [They don’t infect people. My rooster was dying and the lice had been moving off him. Thanks be for the internet, right? LOL] After a very long hot shower I was able to come to my senses… and also knock myself up the head (like I could’ve had a V-8). The reason those poor birds were bald, was because they had a louse infection the propane man couldn’t or wouldn’t handle. THEN I had a flock of birds to treat, and grounds to treat and a coop to treat…. and it was definitely not fun. It apparently is a pretty common condition, and can be spread by wild birds easily. It was ‘kept in check’ in my flock, because they could dust-bathe and were kept clean and healthy otherwise. I might never have figured it out unless things got out of hand in one of those maintenance areas. 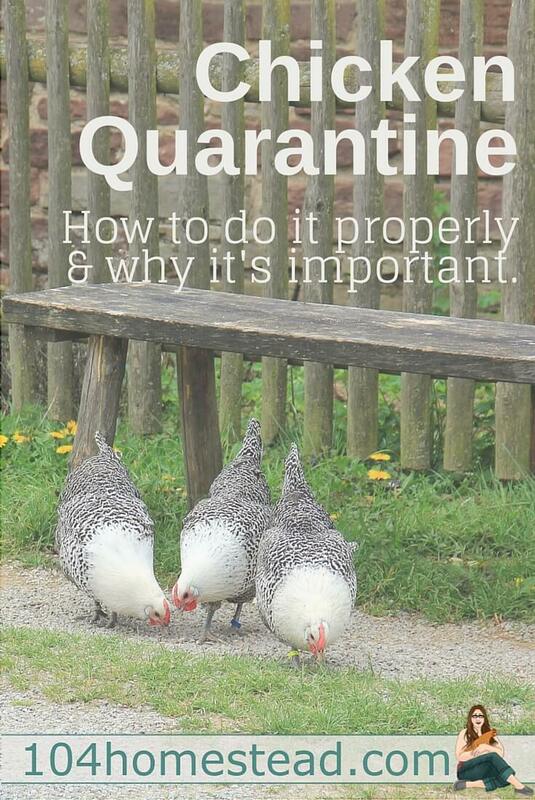 So, quarantine, AND inspect new birds closely (and the flock on a routine basis)! 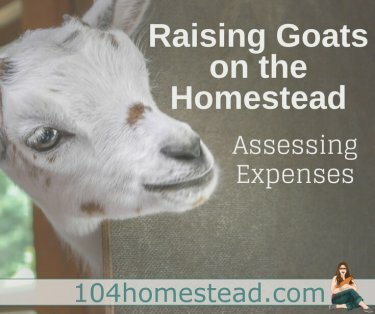 Needless to say, this is an important topic to share, and these are all good lessons for us in managing livestock. I’ll certainly be more diligent when I get chickens again! Great advice! I am lucky enough to have the space for 2 separate pens, about 350 ft apart thanks to my pie shaped suburban lot. The second pen has a very small coop and is in deep shade. I usually lead the chickens to the second pen on hot summer afternoons or if I need to do some work on pen #1. While I wouldn’t typically keep my flock in pen #2 over night due to the small coop size and lower pen security it does come in very handy for quarantine’s. Can you tell me what breed the chickens pictured on this post are please? It is definitely the safest route. An infected chicken may not show outward signs of illness. Better safe than sorry. What you can do which helps with the clothing issue is to take care of your chickens first and then take care of the new chicken(s).